compiled 4 tips that will help you not only plan the event, but also make sure it goes on without issue. The easiest place to start when creating a budget is to ask yourself, “how much can I afford to spend on the event?” Set the amount you’d like to spend, and set the amount of money you could spend if you stretched the budget a bit. Then, create categories for each item you may need for your event and be sure not to forget the small stuff! Keep in mind tax and in some cases, tip amounts that could potentially put you over budget. Individuals organizing a special event quickly realize that when they spread themselves too thin, details inevitably get forgotten. The art of delegation is a must-have skill because by splitting up tasks and having certain staff or volunteers responsible for specific aspects, special event organizers can be sure that the devil is not left in the details. Have a million post-its with to-dos for your event? Searching for that paper with the big idea on it? Employees/volunteers not keeping you up to date on their progress? Consider using a project management system! Cloud-based project management systems are cost-effective online solutions for event organizers that helps to share tasks, keep documents, and store conversations for your event all in one central place. Some examples available are Basecamp, Smartsheet, and Podio, but there are a plethora of other programs that can be customized to fit whatever your specific needs are as an event organizer. 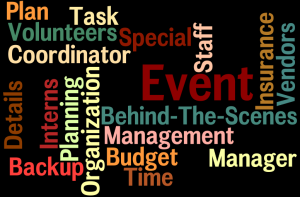 Dedicate time to creating and fine-tuning procedures for the staff and volunteers who are assisting you with your event. If you were unable to complete the event yourself, is there a plan in place for someone to run the event without you? Are backup plans in place in case of an emergency? by prioritizing and streamlining the procedures behind the scenes, you can ensure that your event runs as planned. We hope these 4 steps help YOU to put on your best special event possible and if you have any tips to share with fellow event organizers, tweet them to us at @InsuringEvents!